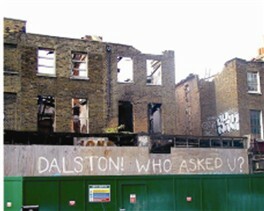 The appearance of bulldozers behind the Georgian terrace at 48-76 Dalston Lane prompts a last ditch endeavour to save these significant buildings. This event unravels a sad tale of neglect and abuse, in the context of a borough caught up in an insane period of ‘investment and development’ and questions the long-term wisdom of the obliteration of old Hackney. Based on a poetic play for voices by Michael Rosen and mixing rarely seen archive footage with new cinematography, Under the Cranes offers a lyrical, painterly evocation of Hackney, over several hundred years. This is a film which poses questions about the nature of regeneration in Hackney in the recent period. It also explores the theme of migration, showing some of the struggles that people go through to secure a place for themselves, (fighting racists if necessary), but also how migration brings diversity and the seeds of renewal. Presenting his own photographic record of the decline of Dalston Lane, Parry–Davies explains the course of events that culminated in inevitable attempts by the owners to erase the historic terrace for short term commercial gain. Similar examples of insensitivities in the name of progress are also presented. Rosen lived for many years in the shadow of the crumbling terrace. He is a long-time sceptic of 'regeneration' and regards Dalston Lane as yet another example of local councils working in cahoots with developers in the interests of profits not people. This page was added on 26/01/2014.